Evie had no idea that this was not the first time that she had lived, that was until she had a stroke which took her to the brink of dying. She found herself, at first, in a bit of a no-mans land before wakening up in the body of a young woman from one of her previous lives. Evie and Astara soon melted into one where Evie begins to experience new life skills that she didn’t have in her present life. This is a truly fascinating back story of the way of life of this tribe and others. The vision quests of the young girls and what they revealed. Astara’s was not what you would call typical. The story shoots forward to Evie’s own childhood, where one curious little girl is eager to want to know about everything but most of all she wants to be loved, she is expected to sit down and be quiet. When a sister arrives for Evie she is over the moon and feels love for her and from her, but Liliana has Down’s syndrome and in the 1950’s and 60’s it wasn’t the easiest time for any disability. This is a story that really gets to your heart. Evie has had quite a journey in her life but could the new skills that she has become aware of make a difference to her life or is it too late? My heart bled for Evie as a child but the relationship that she has with Liliana is something really special. An unbreakable bond and an understanding of Liliana that no-one else has. I easily connected with Evie both as and child and growing up and in her previous life as Astara, all so very different and yet they had the essence of her kind soul through them all. What I got from this story, personally for me, was that it isn’t just our souls that make us who we are but the people we are with too. So always be true to yourself and take a step back and think about the real you too not just what someone else is moulding you into. It also made me step back and think how I influence others, it is never too late. A lovely read. Ernestine B. Colombo fell in love with words when she was a child. Writing poetry and stories became her daily ritual and passion. After earning a B.A. in Journalism from the City College of New York, she went from one job to another until she landed a position at a huge banking corporation. The job became her life. She became immersed in task and duty. Writing was forgotten. Colombo retired in 2011. At first, she lost herself in the healing touch of her garden. Color and pattern took the place of fluorescent lights and deadlines. Seasons passed, the garden expanded, but there were no new words. In 2016, she began a journey of the mind and heart. The result is her first novel, Returning Souls, the story of a woman who gets a second chance at life. Hopefully you will recognize yourself somewhere in these pages. You may start believing we all get a second chance. Poetry is no longer forgotten. In December 2017, Colombo won First Honorable Mention in the PawSome Poetry Contest, sponsored by the Institute of Children’s Literature, for her poem “Navajo Reservation, Canyon de Chelly”. Ernestine can be found living in a suburb of New York City with her partner Michael and her three cats, writing, gardening, and watching the hummingbirds go from flower to flower, taking a sip from each one. 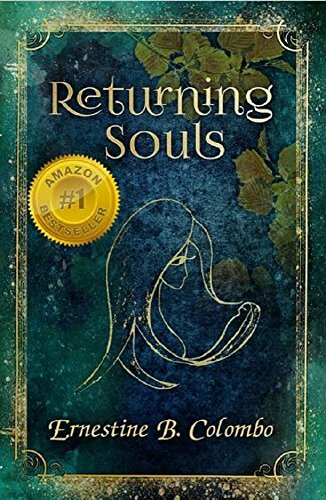 I’m so happy you enjoyed “Returning Souls”, and I thank you for your honest review. I also appreciate your posting your review on Goodreads and Amazon UK – very helpful – and for all the tweets! I am currently working on a sequel set entirely in the prehistoric era of human history, to be released in 2019.